Total knee replacement or total knee arthroplasty, is a surgical procedure in which parts of the knee joint are replaced with artificial parts (prostheses). A normal knee functions as a hinge joint between the upper leg bone (femur) and the lower leg bones (tibia and fibula). The surfaces where these bones meet can become worn out over time, often due to arthritis or other conditions, which can cause pain and swelling. The most common cause of chronic knee pain and disability is arthritis. Although there are many types of arthritis, most knee pain is caused by just three types: osteoarthritis, rheumatoid arthritis and post-traumatic arthritis. Osteoarthritis. This is an age-related wear and tear type of arthritis. It usually occurs in people 50 years of age and older, but may occur in younger people too. The cartilage that cushions the bones of the knee softens and wears away. The bones then rub against one another, causing knee pain and stiffness. Rheumatoid arthritis. This is a disease in which the synovial membrane that surrounds the joint becomes inflamed and thickened. This chronic inflammation can damage the cartilage and eventually cause cartilage loss, pain and stiffness. Rheumatoid arthritis is the most common form of a group of disorders termed inflammatory arthritis. Post-traumatic arthritis. This can follow a serious knee injury. Fractures of the bones surrounding the knee or tears of the knee ligaments may damage the articular cartilage over time, causing knee pain and limiting knee function. There are no absolute age or weight restrictions for total knee replacement surgery. Recommendations for surgery are based on a patient's pain and disability, not age. Most patients who undergo total knee replacement are age 50 to 80, but orthopedic surgeons evaluate patients individually. 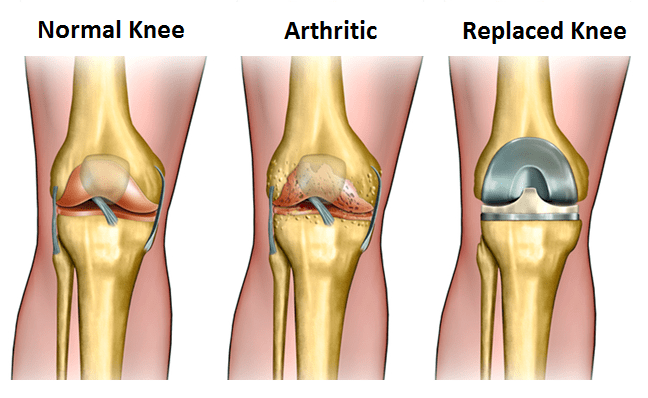 Total knee replacements have been performed successfully at all ages, from the young teenager with juvenile arthritis to the elderly patient with degenerative arthritis. The patients vital signs are checked to make sure blood pressure, heart rate, body temperature and oxygenation levels are normal and surgery can proceed. A mark is made on the knee undergoing surgery. Anesthesia is administered. The patient may receive general anesthesia (be put to sleep) or be given a regional anesthesia to block sensation from the waist down along with a relaxant. What type of anesthesia a patient receives is decided well ahead of time. The surgeon makes an incision down the center of the knee about 8 to 10 inches long, and then cuts through deeper tissue, including the quadriceps tendon and flips over the kneecap to access the femur and tibia. Alternatively, some surgeons make smaller incisions and use minimally invasive techniques for total knee replacement. To improve the surgeons ability to access to the joint, the knee is bent to 90 degrees. The surgeon uses a bone saw to remove the arthritically damaged areas at bottom of the femur and the top of the tibia. Each bone is reshaped to exactly fit its new prosthesis. Because these cuts must be precise, the surgeon uses either a metal jig or computer assistance to line up the cuts. A surgeon may resurface the back of the kneecap or patella and attach an implant. A polyethylene component may be attached to facilitate the patellas gliding against the new joint. Research has not shown a significant difference in outcomes for patients who received patella resurfacing and those who did not. Components are attached to the femur and tibia and patella, if applicable. How the components are attached to the bone will depend on what type of component is used. 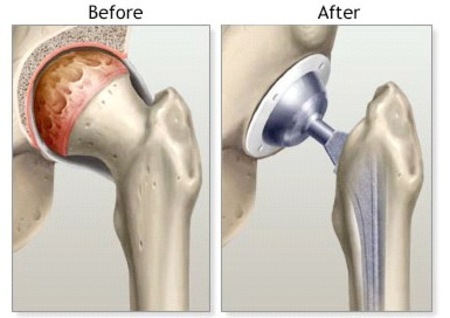 Most knee replacement surgeries use cemented components that are affixed using bone cement. Cemented and cementless components offer different advantages. A flexible cushion made of polyethylene is attached on top of the new tibia surfaces. This spacer acts as a shock absorber between the two new prosthetic surfaces. The leg is flexed and extended to test the fit of the components and the new knees range of motion. The surgeon straightens the knee to allow the components, cement and bone to bond together. Because the bone cement is fast acting, this takes only about 10 minutes. The surgeon will repair any deep tissue that was cut during surgery and then stitches the skin at the incision. Medications are often prescribed for short-term pain relief after surgery. Many types of medicines are available to help manage pain, including opioids, non-steroidal anti-inflammatory drugs (NSAIDs) and local anesthetics. Your doctor may use a combination of these medications to improve pain relief as well as minimize the need for opioids. Be aware that although opioids help relieve pain after surgery, they are narcotic and can be addictive.It is important to use opioids only as directed by your doctor. As soon as your pain begins to improve, stop taking opioids. Talk to your doctor if your pain has not begun to improve within a few days of your surgery. A continuous passive motion (CPM) machine. Most patients begin exercising their knee the day after surgery. In some cases, patients begin moving their knee on the actual day of surgery. A physical therapist will teach you specific exercises to strengthen your leg and restore knee movement to allow walking and other normal daily activities soon after your surgery. To restore movement in your knee and leg, your surgeon may use a knee support that slowly moves your knee while you are in bed. The device is called a continuous passive motion (CPM) exercise machine. Some surgeons believe that a CPM machine decreases leg swelling by elevating your leg and improves your blood circulation by moving the muscles of your leg. It is common for patients to have shallow breathing in the early postoperative period. This is usually due to the effects of anesthesia, pain medications and increased time spent in bed. This shallow breathing can lead to a partial collapse of the lungs which can make patients susceptible to pneumonia. To help prevent this, it is important to take frequent deep breaths. Your nurse may provide a simple breathing apparatus called a spirometer to encourage you to take deep breaths. 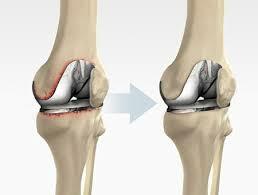 A patients recovery and rehabilitation plan are crucial to the overall success of knee replacement surgery. A recovery and rehabilitation plan can help the patient: Leave the hospital sooner Regain knee strength and range of motion more quickly Resume independent living sooner Avoid potential complications Typically, knee replacement patients are able to leave the hospital within 1 to 5 days (often 2 or 3) and they can take care of themselves and resume most activities 6 weeks after surgery. The majority of patients are 90% recovered after 3 months, though it can take 6 months or longer before they are 100% recovered. Some knee replacement patients do not follow the typical recovery timeline. For example: Patients who did knee-strengthening exercises in preparation for surgery sometimes recover more quickly. Patients who are older, smoke, or have other medical conditions may take longer to heal. Deviation from the typical recovery timeline cannot always be predicted, but these differences are usually okay as long as the patient, doctor and physical therapist, continue to work together towards a full recovery. Total shoulder replacement is a surgery to replace the damaged parts of the shoulder with artificial parts (components) called prostheses. The treatment options are either replacement of just the head of the humerus bone (ball) or replacement of both the ball and the socket (glenoid). The treatment options are either replacement of just the head of the humerus bone (ball) or replacement of both the ball and the socket (glenoid). The goal of total shoulder replacement surgery is to relieve shoulder pain and increase shoulder function by resurfacing the bones that meet at the shoulder's ball-and-socket joint or glenohumeral joint. The surgeon removes the humeral head at the top of the arm bone (humerus), reshapes the shoulder socket (glenoid) and attaches prosthetic components to both bones. If nonsurgical treatments like medications and activity changes are no longer helpful for relieving pain, you may want to consider shoulder joint replacement surgery. Joint replacement surgery is a safe and effective procedure to relieve pain and help you resume everyday activities. ‣ Candidates may have tried non-major surgery, such as arthroscopic shoulder surgery, but did not get adequate relief from symptoms. ‣ Other reasons for having shoulder replacement surgery include a badly broken bone(s) or a tumor. Depending on the condition of your shoulder, your surgeon may replace only the ball. This procedure is called a hemiarthroplasty. In a traditional hemiarthroplasty, the head of the humerus is replaced with a metal ball and stem, similar to the component used in a total shoulder replacement. This is called a stemmed hemiarthroplasty. Some surgeons recommend hemiarthroplasty when the humeral head is severely fractured but the socket is normal. Other indications for a hemiarthroplasty include: Arthritis that only involves the head of the humerus with a glenoid that has a healthy and intact cartilage surface Shoulders with severely weakened bone in the glenoid Some shoulders with severely torn rotator cuff tendons and arthritis Sometimes, surgeons make the decision between a total shoulder replacement and a hemiarthroplasty in the operating room at the time of the surgery. Resurfacing hemiarthroplasty involves replacing just the joint surface of the humeral head with a cap-like prosthesis without a stem. 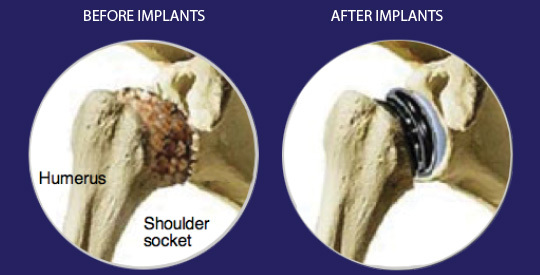 With its bone preserving advantage, it offers those with arthritis of the shoulder an alternative to the standard stemmed shoulder replacement. Resurfacing hemiarthroplasty may be an option for you if: The glenoid still has an intact cartilage surface There has been no fresh fracture of the humeral neck or head There is a desire to preserve humeral bone For patients who are young or very active, resurfacing hemiarthroplasty avoids the risks of component wear and loosening that may occur with conventional total shoulder replacements in this patient population. Due to its more conservative nature, resurfacing hemiarthroplasty may be easier to convert to total shoulder replacement, if necessary at a later time. Another type of shoulder replacement is called reverse total shoulder replacement. Reverse total shoulder replacement is used for people who have: An x-ray of a reverse total shoulder replacement. Completely torn rotator cuffs with severe arm weakness The effects of severe arthritis and rotator cuff tearing (cuff tear arthropathy) Had a previous shoulder replacement that failed For these individuals, a conventional total shoulder replacement can still leave them with pain. They may also be unable to lift their arm up past a 90-degree angle. Not being able to lift one's arm away from the side can be severely debilitating. In reverse total shoulder replacement, the socket and metal ball are switched. That means a metal ball is attached to the shoulder bone and a plastic socket is attached to the upper arm bone. This allows the patient to use the deltoid muscle instead of the torn rotator cuff to lift the arm. ‐ General anesthesia, which means you will be unconscious and unable to feel pain. ‐ Regional anesthesia to numb your arm and shoulder area so that you do not feel any pain in this area. If you receive only regional anesthesia, you will also be given medicine to help you relax during the operation. ‣ The shoulder is a ball and socket joint. The round end of the arm bone fits into the opening at the end of the shoulder blade, called the socket. This type of joint allows you to move your arm in most directions. ‣ Your surgeon may place a tube in this area to drain fluid that may build up in the joint. The drain will be removed when you no longer need it. ‣ This surgery normally takes 1 to 3 hours. ‣ After leaving the operating room with the arm immobilized at the side in a removable canvass arm sling, the patient will wake up in the recovery room. ‣ Based on the range of motion and stability of the implant, physical therapy begins on the first postoperative day, following x-rays documenting that the implant is properly positioned. Sling immobilization is enforced during the early rehabilitation phase to permit the tendons which have been repaired to heal. The sling is removable for showering and rehabilitation exercises. ‣ The patient is permitted to use the hand and wrist soon after surgery, and the whole arm, including shoulder, for light activity beginning at approximately six weeks after surgery. Unrestricted, active use of the arm may begin as early as eight weeks after surgery. ‣ The pre-surgical condition of the shoulder muscles and tendons play the biggest role in the patient’s outcome. If their muscles and tendons are in good shape, rehab will be less burdensome as the type and rapidity of post-surgical rehabilitation of the shoulder depends on the patient’s own muscles and tendons. ‣ At about three months after surgery, most patients are reasonably comfortable, have the motion about half normal, but do notice some weakness. ‣ At six months, most patients are pain-free (although the weather does have an effect), and have motion and strength about two-thirds normal. ‣ At one year, approximately 95% of TSA patients will be pain-free, and the remaining will usually have no more than a weather ache or an occasional ache with excessive activity. Likewise, there will probably not be significant strength limitations, depending on the condition of the deltoid and rotator cuff, particularly if both these muscle groups were normal before surgery. • Don't use the arm to push yourself up in bed or from a chair because this requires forceful contraction of muscles. • Do follow the program of home exercises prescribed for you. You may need to do the exercises 2 to 3 times a day for a month or more. • Don't overdo it! If your shoulder pain was severe before the surgery, the experience of pain-free motion may lull you into thinking that you can do more than is prescribed. • Don't lift anything heavier than a glass of water for the first 2 to 4 weeks after surgery. • Do ask for assistance. Your physician may be able to recommend an agency or facility if you do not have home support. • Don't participate in contact sports or do any repetitive heavy lifting after your shoulder replacement. • Do avoid placing your arm in any extreme position such as straight out to the side or behind your body for the first 6 weeks after surgery. • Many thousands of patients have experienced an improved quality of life after shoulder joint replacement surgery. They experience less pain, improved motion and strength, and better function. In a total hip replacement (also called total hip arthroplasty), the damaged bone and cartilage is removed and replaced with prosthetic components. The damaged femoral head is removed and replaced with a metal stem that is placed into the hollow center of the femur. The femoral stem may be either cemented or press fit into the bone. A metal or ceramic ball is placed on the upper part of the stem. This ball replaces the damaged femoral head that was removed. The damaged cartilage surface of the socket (acetabulum) is removed and replaced with a metal socket. Screws or cement are sometimes used to hold the socket in place. A plastic, ceramic, or metal spacer is inserted between the new ball and the socket to allow for a smooth gliding surface. There are no absolute age or weight restrictions for total hip replacements. Recommendations for surgery are based on a patient's pain and disability not age. Most patients who undergo total hip replacement are age 50 to 80, but orthopedic surgeons evaluate patients individually. Total hip replacements have been performed successfully at all ages from the young teenager with juvenile arthritis to the elderly patient with degenerative arthritis. An evaluation with an orthopedic surgeon consists of several components. ‣ Medical history - Orthopedic surgeon will gather information about your general health and ask questions about the extent of your hip pain and how it affects your ability to perform everyday activities. ‣ Occasionally other tests, such as a magnetic resonance imaging (MRI) scan, may be needed to determine the condition of the bone and soft tissues of your hip. An important factor in deciding whether to have hip replacement surgery is understanding what the procedure can and cannot do. Most people who undergo hip replacement surgery experience a dramatic reduction of hip pain and a significant improvement in their ability to perform the common activities of daily living. With normal use and activity, the material between the head and the socket of every hip replacement implant begins to wear. Excessive activity or being overweight may speed up this normal wear and cause the hip replacement to loosen and become painful. Therefore, most surgeons advise against high-impact activities such as running, jogging, jumping, or other high-impact sports. Realistic activities following total hip replacement include unlimited walking, swimming, golf, driving, hiking, biking, dancing, and other low-impact sports. With appropriate activity modification, hip replacements can last for many years. Many different types of designs and materials are currently used in artificial hip joints. All of them consist of two basic components: the ball component (made of highly polished strong metal or ceramic material) and the socket component (a durable cup of plastic, ceramic or metal, which may have an outer metal shell). The prosthetic components may be "press fit" into the bone to allow your bone to grow onto the components or they may be cemented into place. The decision to press fit or to cement the components is based on a number of factors, such as the quality and strength of your bone. A combination of a cemented stem and a non-cemented socket may also be used. Your orthopedic surgeon will choose the type of prosthesis that best meets your needs. The surgical procedure takes a few hours. Your orthopedic surgeon will remove the damaged cartilage and bone and then position new metal, plastic or ceramic implants to restore the alignment and function of your hip. After surgery, you will be moved to the recovery room where you will remain for several hours while your recovery from anesthesia is monitored. After you wake up, you will be taken to your hospital room. You will most likely stay in the hospital for a few days. To protect your hip during early recovery, a positioning splint, such as a foam pillow placed between your legs, may be used. After surgery, you will feel some pain. This is a natural part of the healing process. Your doctor and nurses will work to reduce your pain which can help you recover from surgery faster. Medications are often prescribed for short-term pain relief after surgery. Many types of medicines are available to help manage pain, including opioids, non-steroidal anti-inflammatory drugs (NSAIDs) and local anesthetics. Your doctor may use a combination of these medications to improve pain relief, as well as minimize the need for opioids. Be aware that although opioids help relieve pain after surgery, they are narcotic and can be addictive. Opioid dependency and overdose have become a critical public health issue in the U.S. It is important to use opioids only as directed by your doctor. As soon as your pain begins to improve, stop taking opioids. Talk to your doctor if your pain has not begun to improve within a few days of your surgery. Walking and light activity is important to your recovery. Most patients who undergo total hip replacement begin standing and walking with the help of a walking support and a physical therapist the day after surgery. In some cases, patients begin standing and walking on the actual day of surgery. The physical therapist will teach you specific exercises to strengthen your hip and restore movement for walking and other normal daily activities. The success of your surgery will depend in large measure on how well you follow your orthopedic surgeon's instructions regarding home care during the first few weeks after surgery. You may have stitches or staples running along your wound or a suture beneath your skin. The stitches or staples will be removed approximately 2 weeks after surgery. Avoid getting the wound wet until it has thoroughly sealed and dried. You may continue to bandage the wound to prevent irritation from clothing or support stockings. Your New Hip Is Different? You may feel some numbness in the skin around your incision. You also may feel some stiffness, particularly with excessive bending. These differences often diminish with time, and most patients find these are minor compared with the pain and limited function they experienced prior to surgery. Your new hip may activate metal detectors required for security in airports and some buildings. Tell the security agent about your hip replacement if the alarm is activated. You may ask your orthopedic surgeon for a card confirming that you have an artificial hip. There are many things you can do to protect your hip replacement and extend the life of your hip implant. Participate in a regular light exercise program to maintain proper strength and mobility of your new hip. Take special precautions to avoid falls and injuries. If you break a bone in your leg, you may require more surgery. Make sure your dentist knows that you have a hip replacement. Talk with your orthopedic surgeon about whether you need to take antibiotics prior to dental procedures. See your orthopedic surgeon periodically for routine follow-up examinations and x-rays, even if your hip replacement seems to be doing fine. Knee revision surgery, which is also known as revision total knee arthroplasty, is a procedure in which the surgeon removes a previously implanted artificial knee joint or prosthesis and replaces it with a new prosthesis. Knee revision surgery may also involve the use of bone grafts. The bone graft may be an autograft, which means that the bone is taken from another site in the patient's own body; or an allograft, which means that the bone tissue comes from another donor. ‣ Pain is the primary reason for revision. Usually, the cause is clear but not always. Knees without an obvious cause for pain in general do not do as well after surgery. ‣ Plastic (polyethylene) wear This is one of the easier revisions where only the plastic insert is changed. ‣ Instability This means the knee is not stable and may be giving way or not feel safe when you walk. ‣ Loosening of either the femoral, tibial or patella component This usually presents as pain but may be asymptomatic. It is for this reason why you must have your joint followed up for life as there can be changes on X-ray that indicate that the knee should be revised despite having no symptoms. ‣ Infection- usually presents as pain but may present as swelling or an acute fever. ‣ Osteolysis (bone loss). This can occur due to particles being released into the knee joint that results in bone being destroyed. Revision total knee replacement is more complex and takes longer to perform than primary total knee replacement. In most cases, the surgery takes from 2-3 hours. To begin, your doctor will follow the line of the incision made during your primary total knee replacement. The incision may be longer than the original, however to allow the old components to be removed. Once the incision is made, the doctor will move the kneecap and tendons to the side to reveal your knee joint. Your doctor will examine the soft tissues in your knee to make sure that they are free from infection. He or she will assess all the metal and/or plastic parts of the prosthesis to determine which parts have become worn or loose or shifted out of position. Your doctor will remove the original implant very carefully to preserve as much bone as possible. If cement was used in the primary total knee replacement, this is removed, as well. Removing this cement from the bone is a time-consuming process that adds to the complexity and length of the revision surgery. After removing the original implant, the doctor will prepare the bone surfaces for the revision implant. In some cases, there may be significant bone loss around the knee. If this occurs, metal augments and platform blocks can be added to the main components to make up for the bony deficits. Rarely, the bone graft material may be used to help rebuild the knee. The graft may come from your own bone (autograft) or from a donor (autograft). Finally, the doctor inserts the specialized revision implant, repairs any surrounding soft tissues that are damaged and carefully tests the movement of the joint. A drain may be placed in your knee to collect any fluid or blood that may remain after surgery. After surgery, you will be moved to the recovery room where you will remain for several hours while your recovery from anesthesia is monitored. After you wake up, you will be taken to your hospital room. You will wake up in the recovery ward where you will be closely monitored until you are ready to return to your ward. Here you will continue to be observed until you are fully awake. Usually, you will spend the first postoperative day in bed. A physiotherapist will visit you to give you breathing exercises for your chest as well as exercises for your leg that can be performed whilst in bed. An x-ray of your knee will be taken to confirm optimal placement of the prosthesis. Blood-thinning medications will be administered daily to reduce the risk of blood clots (DVT) forming in your legs. In addition, you will be given special stockings (TEDs) to wear on both of your legs. For the first 24 hours after your operation, an inflatable sleeve will intermittently compress your calves to prevent stagnation of blood flow. You will receive intravenous antibiotics after your surgery for a designated period of time depending on the complexity of the operation. This will help to decrease the risk of infection. Your bandages will be removed at 48 hours after the operation. A new dressing will be placed over the incision. Your knee will be quite swollen and usually has areas of bruising around it. This is normal. You will be under the daily supervision of a physiotherapist until you are discharged from the hospital. The aims of these visits are to optimize motion in the knee, regain ambulation, improve muscle strength and control knee swelling. Once you are mobilizing safely, have regained appropriate motion in your knee and your pain is controlled by tablets, you will be able to go home. Some patients require further inpatient care and are transferred to a rehabilitation unit for a short time. Your rehabilitation will continue after you leave the hospital to initially maintain and improve on what you have already achieved. This will take the form of a home exercise program and outpatient physiotherapy visits, which usually last 3-6 months. An appointment will be made to see your surgeon six weeks after the operation. The goals of your revision knee replacement surgery are to be able to walk independently, to be able to bend your knee and to reduce the pain you were experiencing prior to your surgery. Your therapist will work with you to help keep your revised knee joint healthy for as long as possible. This may require that you adjust your activity choices to keep from putting too much strain on your revised knee joint. Heavy sports that require running, jumping, quick stopping and starting and cutting are discouraged. Patients may need to consider alternate jobs to avoid work activities that require heavy lifting, crawling, and climbing. The therapist's goal is to help you maximize strength, walk normally and improve your ability to do your activities. When you are well under way, regular visits to the therapist's office will end. Your therapist will continue to be a resource, but you will be in charge of doing your exercises as part of an ongoing home program. The vast majority of patients who have revision surgery experience favorable long-term outcomes, including relief from pain and increased stability and function. Complete pain relief and restoration of function are not always achievable, however some patients may still experience pain or knee stiffness following revision surgery. Partial hip replacement (also called total hip hemiarthroplasty) is an operation that is used most commonly to treat a fractured hip. 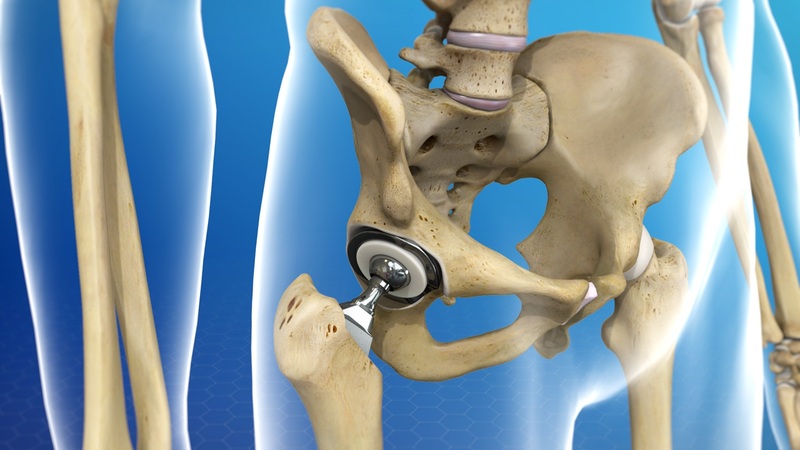 The operation is similar to a total hip replacement, but it involves only half of the hip. 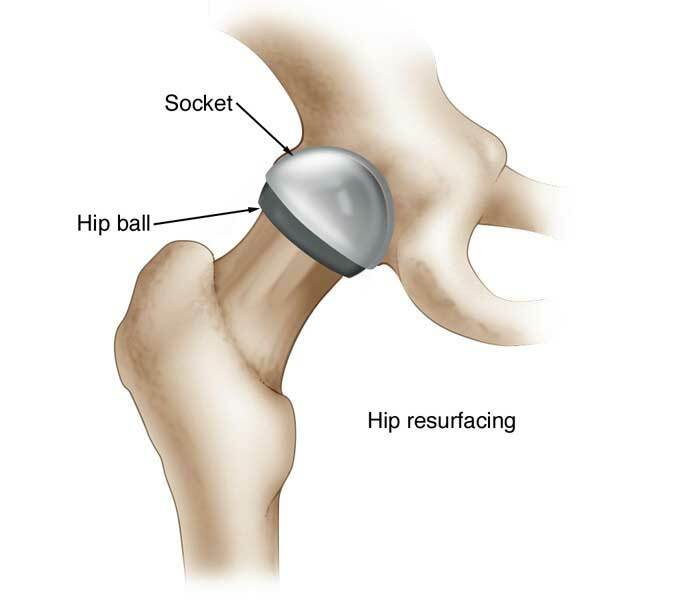 The hemiarthroplasty replaces only the ball portion of the hip joint, not the socket portion. In a total hip replacement, the socket is also replaced. How is the partial hip replacement different from total hip replacement? The partial hip replacement surgery is less invasive than total hip replacement. With the partial procedure, only the ball of the femur must be replaced and the joint socket is left alone. 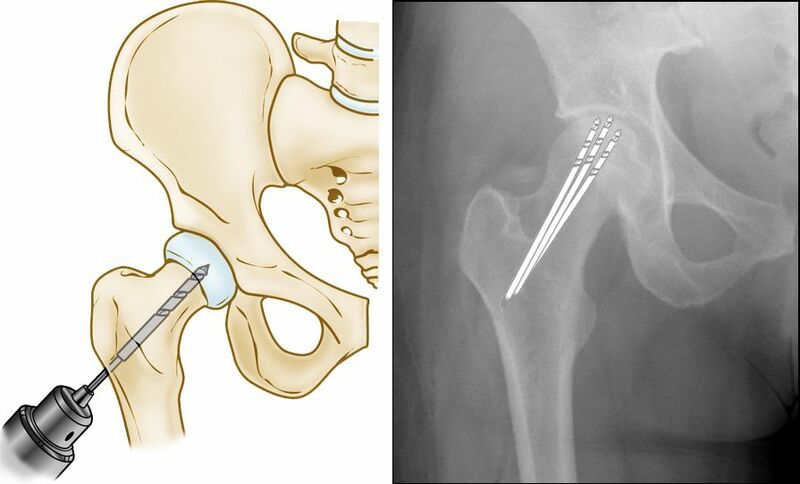 This surgery is used for patients who require replacement of the femoral head. ‣ The fracture has disrupted the blood supply to the femoral head. In this case, even if the fracture heals the head of the femur will crumble. This is known as avascular necrosis and will lead to the hip joint failing. • osteoarthritis of the acetabulum.If the hip socket (or acetabulum) is worn out or damaged due to osteoarthritis then a hemiarthroplasty will not succeed. In this case a total hip replacement may be required. This operation is usually an emergency surgery resulting from a hip fracture that often results from a fall. For this reason, it is likely you may not have had time to plan and prepare. If you come into the Emergency Department, the ED doctors will make sure you are stable. They may give you some fluids and oxygen as well as pain relief, before sending you to get X-Rays of your hip. The orthopedic surgeons will need to see you to assess your injury and your general health before deciding if you can be taken straight to surgery. The Ilizarov method is widely used to treat complex and open bone fractures. This method is preferred over conventional treatment options (such as internal fixator or cast) where there is a high risk of infection or the fracture is of such severity that internal fixators are unworkable. ‣ You will be asked not to eat anything until the plan for surgery is confirmed. In the meantime, you will be kept comfortable and possibly taken up to the ward. Ideally, a caregiver such as a family member or friend will help make arrangements for you while you are in the hospital. The surgeon and care team will communicate with your caregiver to help with these preparations. You will usually stay in the hospital for a few days. After surgery, the site of the incision will be covered with a dressing. Special boots or stockings are placed on your feet to help prevent blood clots from forming. To protect your hip during early recovery, a special triangular splint may be placed in-between your legs to keep them apart. After surgery, you will feel pain in your thigh. If you have been given a spinal injection during your anesthetic, your legs may be numb for the first 12 hours. Pain medication, either tablets or injections, will be given to make you as comfortable as possible. To avoid lung problems after surgery, you will be asked to breathe deeply and cough frequently. This will help avoid pneumonia and lung collapse. Walking and light activity is important to your recovery and will begin the day of or the day after your surgery. Most patients who undergo total hip replacement begin standing and walking with the help of a walking support and a physiotherapist the day after surgery. The physiotherapist will teach you specific exercises to strengthen your hip and restore movement for walking and other normal daily activities. It is important to keep your wound as dry as possible. Most patients are discharged home with a waterproof dressing, which can be left on for showering. During the first 24 hours, it is normal to have some minor bleeding. After being discharged home there should be no discharge, redness or bleeding around the wound. There are usually no specific diet or extra vitamins / nutrients needed to recover from a total hip operation. It is important to have a normal healthy balanced diet and plenty of nonalcoholic fluids. Physiotherapy and the exercises that you perform at home are extremely important to achieve the best results after a hip replacement. After returning home, you should gradually be able to do more and more. It is important to look after your new hip and follow your surgeon's and physiotherapy instructions. Osteotomy literally means cutting of the bone. In a knee osteotomy, either the tibia (shinbone) or femur (thighbone) is cut and then reshaped to relieve pressure on the knee joint. Knee osteotomy is used when a patient has early-stage osteoarthritis that has damaged just one side of the knee joint. By shifting weight off the damaged side of the joint, an osteotomy can relieve pain and significantly improve function in an arthritic knee. Osteotomy surgery is generally reserved for younger, active patients who have osteoarthritis affecting only one compartment of the knee joint. It has been shown to have a good effect in increasing the lifespan of the natural knee joint and delaying the time before knee replacement surgery becomes necessary. 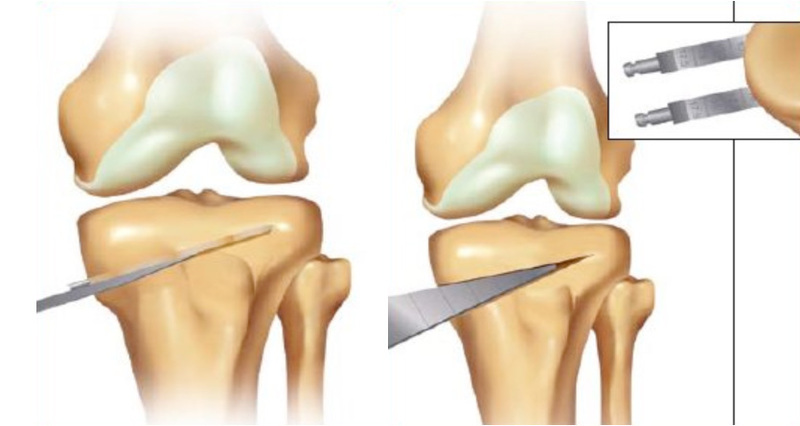 This is the most common osteotomy performed around the knee and is often performed using an opening wedge technique. It is used when there is OA on the medial (inner) side of the knee. Most often, an opening wedge is created on the medial side of the upper tibia to push the weight on to the outer (lateral) compartment of the knee. This is used when there is arthritis in the outer (lateral) compartment of the knee. In order to transfer the pressure to the healthier medial side an opening wedge is made on the lateral part of the lower femur bone. A knee osteotomy operation typically lasts between 1 and 2 hours. Your surgeon will make an incision at the front of your knee, starting below your kneecap. He or she will plan out the correct size of the wedge using guide wires. With an oscillating saw, your surgeon will cut along the guide wires and then remove the wedge of bone. He or she will close or bring together the bones in order to fill the space created by removing the wedge. Your surgeon will insert a plate and screws to hold the bones in place until the osteotomy heals. This is the most commonly used osteotomy procedure and is called a closing wedge osteotomy. In some cases, rather than closing the bones the wedge of bone is opened and a bone graft is added to fill the space and help the osteotomy heal. This procedure is called an opening wedge osteotomy. Whilst in hospital, a physiotherapist will provide instructions on leg exercises that can be performed whilst in bed and also assist you in using crutches to walk. It is common to be on crutches with a closing wedge osteotomy for up to six weeks and occasionally up to 8-10 weeks with an opening wedge osteotomy as it takes longer for this type to heal. Your physiotherapy will focus on regaining knee movement, improving your mobility and maintaining muscular strength around the knee joint. Additionally, you will learn techniques to control the swelling in the knee. Once you are comfortable and are mobilizing safely, your surgeon will allow you to be discharged home. The majority of patients discharged home within two days of the surgery. For the first month, your leg may be swollen and your knee may feel somewhat stiff. It is normal to require regular pain medication during this period. It is extremely important to perform your exercises regularly whilst at home to optimize your outcome following surgery. 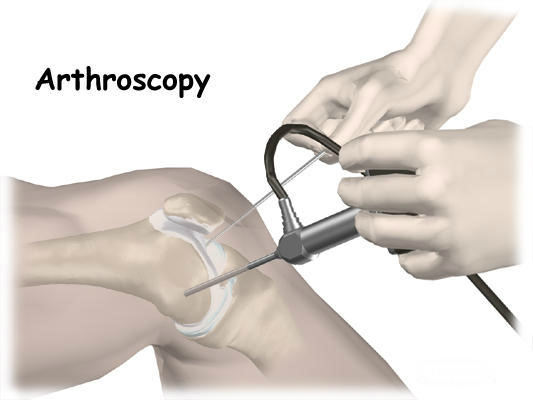 Arthroscopy involves looking at the inside of the knee joint with a small telescope and camera (arthroscope). The image is projected onto a television monitor via a fiber optic cable. This modern technology allows the surgeon to fully inspect all of the interior structures of the knee joint without needing open surgery. Despite the fact that the incisions are quite small, a large amount of surgery can be performed within the knee. Arthroscopic surgery is usually performed as day surgery. ‣ Removal of loose bodies (cartilage or bone that has broken off) and cysts. If you are awake, you may be able to watch the procedure on a monitor. The surgeon will begin by making a few small incisions or cuts in your knee. Sterile salt water or saline will then pump in to expand your knee. This makes it easier for the surgeon to see inside the joint. The arthroscope enters one of the cuts and the surgeon will look around in your joint using the attached camera. The surgeon can see the images produced by the camera on the monitor in the operating room. When the surgeon locates the problem in your knee, they may then insert small tools into the incisions to correct the issue. After the surgery, the surgeon drains the saline from your joint and closes your cuts with stitches. ‣ A bandage will be around the operated knee. ‣ Once you are recovered your drip will be removed and you will be shown a number of exercises to do. ‣ Your Surgeon will see you prior to discharge and explain the findings of the operation and what was done during surgery. ‣ You can remove the bandage in 24 hours and place waterproof dressings (provided) over the wounds. ‣ Please make an appointment 7-10 days after surgery to monitor your progress and remove the 2 stitches in your knee. The Ilizarov apparatus are used in surgical procedures to lengthen or reshape limb bones. In addition, the procedure is often used to treat complex and/or open bone fractures, where conventional treatment techniques cannot be used. It can also be used to treat infected non-unions of bones not amenable with other techniques. ‣ No skin incision is made as in a conventional operation. Incidents of haemorrhage, tissue trauma and infection are much fewer. ‣ The whole procedure is minimally invasive as only wires fix the bones to the rings and there is very little soft tissue damage. ‣ The Ilizarov fixator is very versatile,the cylindrical shape of the fixator allows deformities to be corrected simultaneously in 3 dimensions. ‣ The patient remains mobile throughout the course of the treatment. Intensive physiotherapy is instituted early, as a consequence problems of joint stiffness and contractures are rare. Further, the patients stay in the hospital is considerably reduced. A device is a specialized form of an external fixator, a circular fixator, modular in construction. Stainless steel rings are fixed to the bone via stainless steel heavy-gauge wire (called pins). The rings are connected to each other with threaded rods attached through adjustable nuts. The circular construction and tensioned wires of the Ilizarov apparatus provide far more structural support than the traditional mono-lateral fixator system. This allows early weight-bearing. The frame can be used to support a fractured limb, but it is most commonly used to correct deformity through allostasis. The procedure consists of an initial surgery, during which the bone is surgically fractured and the ring apparatus is attached. As the patient recovers, the fractured bone begins to grow together. While the bone is growing, the frame is adjusted by means of turning the nuts, thus increasing the space between two rings. As the rings are connected to opposite sides of the fracture, this adjustment, done daily, moves the now-healing fracture apart by approximately one millimeter per day. The incremental daily increases result in a considerable lengthening of the limb over time. Once the lengthening phase is complete, the apparatus stays on the limb to facilitate healing. The patient can move about on crutches and pain is lessened. Once healing is complete, a second surgery is necessary to remove the ring apparatus. The result is a limb that is significantly longer. Additional surgery may be necessary in the case of leg lengthening to lengthen the Achilles tendon to accommodate the long bone length. The major advantage of this procedure is that because the apparatus provides complete support while the bone is recovering the patient can remain active aiding recovery. A further use is of bone transport, whereby a defect in a long bone can be treated by transporting a segment of bone, whilst simultaneously lengthening regenerate to reduce the defect and finally dock with the other segment, producing a single bony unit. While the Ilizarov apparatus is minimally invasive (no large incisions are made) it is not free of complications. Pain is common and can be severe, but is treatable with analgesics. Careful attention to daily cleaning and hygiene is necessary to prevent pin site infection. Other complications include swelling and muscle transfixion. Hip resurfacing is a conservative artificial joint replacement, where the hip joint is relined, instead of being completely replaced as in total hip replacement procedure. The goal of hip resurfacing is to provide a more active and improved quality of life. This is done by restoring functionality to the hip through replacing damaged bone and cartilage in the socket while preserving as much natural bone as possible. In hip resurfacing, the femoral head is not removed but is instead trimmed and resurfaced with a smooth metal dome. • Many candidates for hip resurfacing tend to be under 60, with strong, healthy bones as it leaves more bone intact. • Hip resurfacing surgery (HRS) can address pain from mild to moderate osteoarthritis before major bone damage has occurred. Referred pain from the back, poor circulation or damaged nerves may not be resolved with an HRS. ‣ All conservative treatments have already been tried and unsuccessful. ‣ There is debilitating and severe pain with loss of function. ‣ Surgeon will send you for routine blood tests and any other investigations required prior to your surgery. ‣ You will be asked to undertake a general medical check-up with a physician. ‣ You should have any other medical, surgical or dental problems attended to prior to your surgery. ‣ Make arrangements for help around the house prior to surgery. ‣ Cease aspirin or anti-inflammatory medications 10 days prior to surgery as they can cause bleeding. ‣ Cease any naturopathic or herbal medications 10 days before surgery. ‣ Stop smoking as long as possible prior to surgery. You will wake up in the recovery room with a number of monitors to record your vitals(Blood pressure, Pulse, Oxygen saturation, temperature, etc.) You will have a dressing on your hip and drains coming out of your wound. Post-operative X-rays will be performed in recovery. Once you are stable and awake you will be taken back to the ward. You will have one or two IVs in your arm for fluid and pain relief. This will be explained to you by your anesthetist. On the day following surgery, your drains will usually be removed and you will be allowed to sit out of bed or walk depending on your surgeons preference. It is normal but if you are in a lot of pain, inform your nurse. You will be able to put all your weight on your hip and your physical therapist will help you with the post-op hip exercises. You will be discharged home or to a rehabilitation hospital approximately 5-7 days depending on your pain and help at home. Sutures are usually dissolvable but if not are removed at about 10 days. A post-operative visit will be arranged prior to your discharge. You will be instructed to with crutches for two weeks following surgery and to use a cane from then on until 6 weeks post-op. It is important to keep your wound as dry as possible. Most patients are discharged home with a waterproof dressing, which can be left on for showering. During the first 24 hours, it is normal to have some minor bleeding. After being discharged home, there should be no discharge, redness or bleeding around the wound. Core decompression is a surgical procedure that involves surgical drilling into the area of dead bone near the joint. This reduces pressure allows increased blood flow and slows or stops bone and/or joint destruction. Core decompression is commonly performed to treat osteonecrosis. This procedure involves drilling one larger hole or several smaller holes into the femoral head to relieve pressure in the bone and create channels for new blood vessels to nourish the affected areas of the hip. When osteonecrosis of the hip is diagnosed early core decompression is often successful in preventing the collapse of the femoral head and the development of arthritis. Core decompression is often combined with bone grafting to help regenerate healthy bone and support cartilage at the hip joint. Core decompression prevents osteonecrosis from progressing to severe arthritis and the need for hip replacement in 25% to 85% of cases. This depends upon the stage and size of the osteonecrosis at the time of the procedure. Core decompression achieves the best results when osteonecrosis is diagnosed in its early stages before the bone collapses. In many of these cases, the bone heals and regains its blood supply after core decompression. It takes a few months for the bone to heal, and during this time, a walker or crutches will be needed to prevent putting stress on the damaged bone. Patients with successful core decompression procedures typically return to walking unassisted in about 3 months and have complete pain relief. When osteonecrosis is diagnosed after collapse of the bone, core decompression is not usually successful in preventing further collapse. In this situation, the patient is best treated with a total hip replacement, which relieves pain and restores function in 90% to 95% of patients. The operation is an open procedure and the surgeon uses x-ray guidance to be able to clearly visualize the area. The surgeon takes a plug of bone out of the affected area and often places bone chips back into the area to provide an osteoinductive (bone forming) environment. As blood flow is restored to the area, the bone chips provide a scaffolding and stimulus for new bone to form. Synovectomy surgery is done to remove inflamed joint tissue (synovium) that is causing unacceptable pain or is limiting your ability to function or your range of motion. Ligaments and other structures may be moved aside to access and remove the inflamed joint lining. The procedure may be done using arthroscopy. Synovectomy may be used to treat joints affected by rheumatoid arthritis that have minimal bone or cartilage destruction when medicine has not relieved pain. Synovectomy may be considered if significant pain persists after 6 to 12 months of drug treatment including the use of disease-modifying antirheumatic drugs (DMARDs). Local, regional, or general anesthesia is used depending on the location of the joint, amount of synovium to be removed and the technique employed. The procedure can be performed in an outpatient or inpatient setting depending on the technique. More often for larger joints (i.e., knee, shoulder, hip) and increasingly for smaller joints, a Synovectomy has performed arthroscopically. 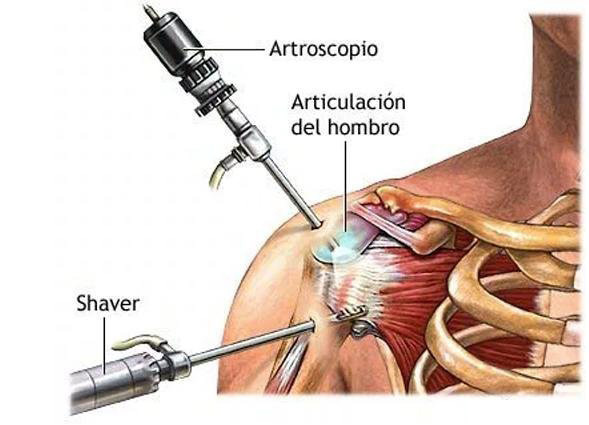 A thin, fiberoptic surgical and viewing instrument (arthroscope) is inserted into the joint space through a small skin incision to visualize the interior of the joint. Instruments are then inserted into the joint through 4 or 5 other tiny incisions (portals) to cut away the synovium. An irrigation solution is infused into the joint to help clear the area of debris created during the procedure. The arthroscopic approach is generally minimally invasive and requires only a few small incisions. Consequently, less tissue trauma may be associated with arthroscopic surgery than with open surgery. For larger joints, this may result in a shorter hospital stay, reduced postoperative joint stiffness and a complete Synovectomy. After the surgery, a pressure dressing is applied and the joint is kept mobile to inhibit scarring. In an open procedure the joint capsule is exposed through an incision over the affected joint (arthrotomy). The synovium is identified and removed by cutting. A soft pressure dressing is applied to control swelling. Early limited joint motion is encouraged to prevent scar tissue (adhesions) from forming in the joint that would limit the range of motion. The goal of rehabilitation after synovectomy is to decrease pain and to restore function. The intensity and duration of rehabilitation depend on the underlying condition, the involved body part, and the preoperative functional status of the individual. Modalities such as heat and cold are used to control pain and swelling (Braddom). If the lower extremity is involved, assistive devices may be used to promote independent ambulation, although typically weight bearing is not limited. Individuals may be instructed in a gentle range of motion and strengthening exercises to be continued independently in order to preserve joint mobility and function. Limited supervised rehabilitation is indicated in most cases. Prior to discharge from therapy, individuals should be educated in ways to protect the involved joint and in self-care, including a home exercise program. If impaired function persists, modifications in lifestyle and the workplace may be recommended by an occupational therapist or ergonomist (Firestein).